I have already spoken about Understanding White Privilege on my blog, but after watching a few videos on YouTube I’ve realised that I haven’t spoken about the privileges a lot of us have. We are bound to have one or more types of privileges. We all understand white privilege, and the not so subtle ways it is displayed. But do we understand and utilise our own privileges? The idea for this post came after watching Seren’s PSA Systematic Oppression Is Not The Same As Individual Experiences. Seren confronts comments like “white people treat me fine so I don’t know why you’re complaining“. A common response when black people speak on their experiences. People tend to get personal experiences confused with systematic oppression. Everyone is going to experience different things, not every black person is going to be treated badly, that’s a given but black people are systematically oppressed. White people can be nice to us everyday. If the system still benefits from racial oppression then what is a few nice experiences with white people? What classifies as a privilege? Our privileges steam from what we have access to and where we are seen and heard more. We cannot choose our privileges, which is why it’s so important to use your privilege to shed light on those who do not benefit from the same things as you. The easiest way for me to understand and explain privilege is to say that anything that is seen as “standard” within society makes you privileged. 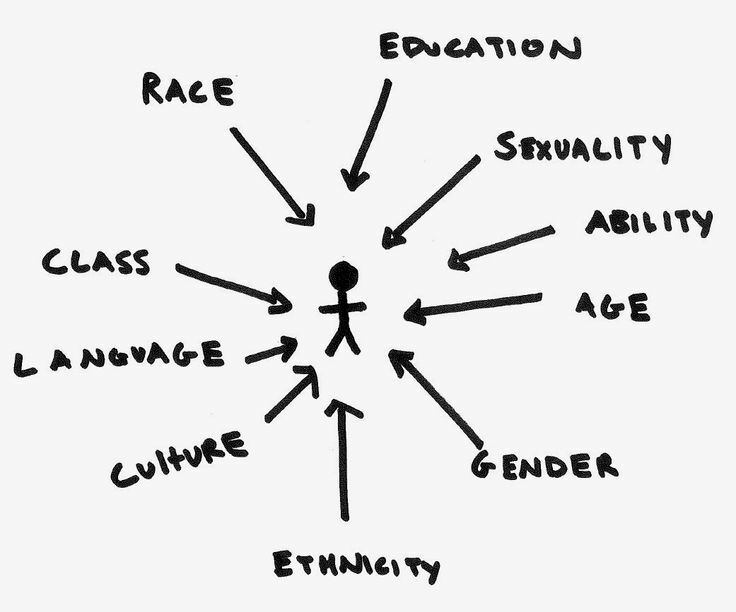 Anybody outside of the “norm” tends to deal with different forms of discrimination and/or oppression. How do I utilise my privilege? Identifying your privileges doesn’t make you a bad guy, In fact it’s a good start if you can identify exactly what your privileges are. Once you have identified what those privileges are you can begin to use them to move the community further. Listen – With social media being a source of information for many people these days, we are able to listen to the experiences of the oppressed. It’s important to listen and take in what is being said. Oppression works sickeningly well because it is systematic, institutionalised and many have been convinced that it is just the natural order of things. Which is why so many people either ignore what is being said or accuse the oppressed of attention seeking. Listening is the first step, learn to put aside your own thoughts and feelings for the moment to really take it all in. Understand – Many do not understand how privileges work as they are occasionally disguised as “justifiable norms“. Rarely people understand the impact of several disadvantages, simply saying “stop complaining and work harder” is unproductive. 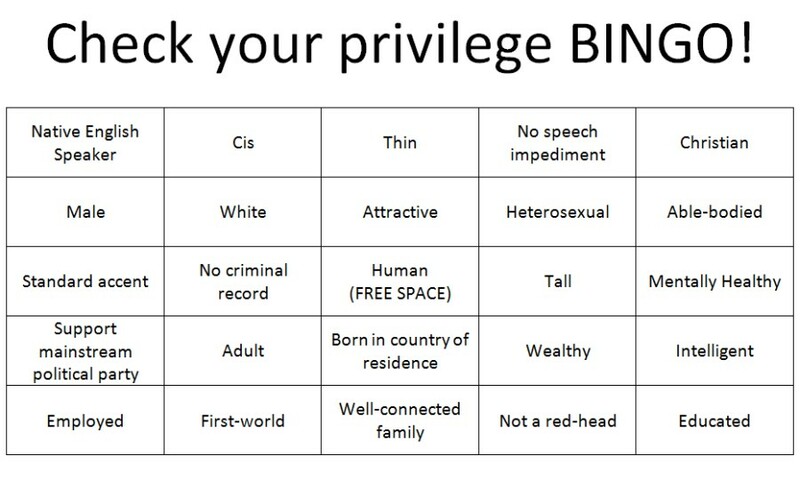 If you can tick off the majority of those privileges on the bingo card above then you’re one privileged dude. If you find that you can only tick the odd one or two off of the list then it is even more important that you utilise whatever privilege you do have. I think the more you can tick off the more responsibility you have, and you will have more of a platform and a larger audience to speak to. Learn – Once you have identified and understood your privileges it is equally as important to get that knowledge up. Learn the do’s and don’ts when utilising your privilege, sometimes it can get used incorrectly, especially if money is involved. Have conversations and ask questions, find out what you have to know in order for you to speak confidently and honestly. A common mistake people make is confusing appropriation with appreciation, the best way to show appreciation is to give credit, show whatever it is in all of it’s authenticity. Action – Utilising your privilege is opening doors for the less privileged. Being mindful of those who should be credited and praised as well as yourself. Realising that there is room for more than one successful individual, if you continue to encourage that space to be opened up. Identifying missed opportunities is also a great way to utilise your privilege. A big example of missed opportunities and lazy attempts at representation would be Boohoo’s latest #AllGirls campaign. The word all is inclusive, however the campaign itself seemed to be very traditional in the sense that everyone was white or light skinned, slim and able-bodied, with the one dark skinned sister. If you have a quick look outside that would not even be an accurate representation of the women on your street, so I don’t know what definition of all girls Boohoo’s marketing team looked up, but someone needs to search that into google one more time. Give the floor, the mic, the whole stage to those who are continuously ignored. The fear of having the light taken away from you is what is holding us back, this fear that there’s not enough space for us to all shine is false. We are not all the same, giving space and time to others doesn’t mean there is none left for you. Start small and work your way up to something bigger with more impact.